A single piece of kit that can totally revolutionise your training and introduce the very best of gymnastic training without the hassle. Parallettes are easy to use, simplified versions of the parallel bars. They’re a perfect place to start for beginners in gymnastic strength training – offering access to push ups, L-sits, and other support positions. They’re also easy to use, move, and store! Made from heavy duty steel with a hard-wearing finish, they’re reliable, sturdy, and ready to go when you are. They’re seriously tough and seriously affordable. 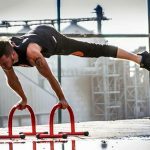 If you’re looking for a quick upper body workout at home, or to add gymnastic strength training to your lifting, the Pull Up Mate Parallette is a perfect place to start. Price is for a pair of (two) parallettes. One of the most used exercise on parallette bars is known as the L-Sit, a particularly difficult push up and hold which will strengthen the triceps. It can be executed by positioning the two bars shoulder length apart and using a firm grip to lift yourself off the ground. The lift is complete when the elbows are locked and your legs are straightened at a 90-degree angle with your torso. You should hold this position for as long is comfortable and then increase the duration as your resistance improves. Some users of parallette bars may overlook the simple push up as a viable exercise. However, by placing the hands on the elevated bars rather than the floor, any dangerous strain on the wrist is reduced and a higher range of motion achieved. You can also lower the chest beneath your arms when the push up is in process – this will work the arms more when lifting. Variations include an elevated push up, with your feet on a raised surface, or even a handstand push up for the more advanced. A similar exercise comes with the V-Sit, although the stress is focussed more on the abdomens and flexibility of the lower back. To perform a repetition, brace yourself in the same position as the L-Sit with your elbows locked at shoulder length. However, you should now lift your legs in line with your chest and hold for as long feels necessary. To increase the workout, raise your legs higher or even horizontally to help develop an intense abdominal strength. Your arms will still benefit from performing a V-Sit, especially the triceps. A more advanced type of exercise you can use our parallettes for is handstands. In order to complete this exercise safety, you will need good core strength for stability, and a developed upper body to allow manoeuvrability and sustainment. In order to build up strength and confidence it helps to have someone nearby as a stability aid. Alternatively, place the parallettes adjacent to a wall for you to lean against to begin with. Feel confident performing calisthenics on these bars! Very solid and stable.